Football season is here! As an avid Alabama fan (Roll Tide! ), I love the fall and enjoy spending my Saturdays (post long run, of course) watching college football. I’m not a huge professional football fan, but I am a huge fan of competition and I’m in two fantasy football teams, so I do follow my players on Sundays (and Mondays and sometimes Thursdays). What goes perfectly with a game? Food of course! However, while I’m a fan of snacks (a BIG fan), I’m not always down for the calorie laden versions (sometimes I am). 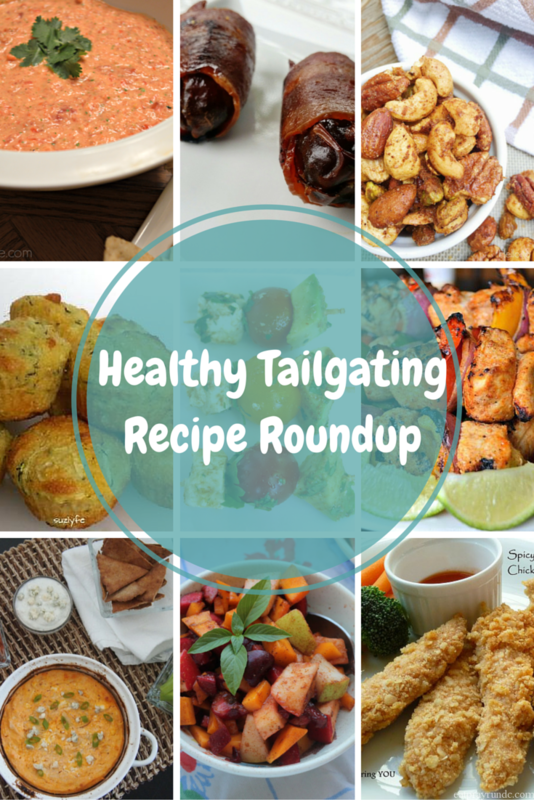 So I thought I’d share this round up of healthy tailgating recipes that you can pin or save and use as a go to all season long! What’s your favorite thing to munch on while watching the game? Who’s your team? Loooove game day eats! Thanks for including my Buffalo Quinoa Bites! Can’t wait to check out the rest of the round up! thanks for letting me share em – so yummy!! Natalie @ A Fit Philosophy recently posted…Protein Pancakes – Oh MY! i’m kind of obsessed w/bacon wrapped dates so i loved your spin on them! Susie @ SuzLyfe recently posted…Get #BosuStrong with this Full Body Bosu Core Exercise! haha, sounds delicious! thanks for letting me share! While I’m not super big into football, my entire work is so we watch a lot and have a few parties. I think I’ll have to try one of these for our next party! Wow, some really tasty sounding ones in here. I love “comfort” foods this time of year, although I’m also trying to shed weight in the off-season since I tend to put it on during peak training. Good to know of some healthier options! Some of these look absolutely amazing! I will definitely have to try some out. Thanks so much for sharing with us. yum! Courtney, I LOVE when you put these recipe roundups together!!! Thank you so much; pinning now! This round up is awesome! Totally pinning it for upcoming football parties!! Thanks so much for featuring my recipe!! Thank you for including my roasted red pepper hummus! I’ll be making it soon — yummy!!! Thanks for doing all the work for me!! After this past weekend I realized how in trouble I am trainjng for a marathon during football season…..ha! Yum, I love game day foods but hate how unhealthy most of them are. I’m definitely going to check these out. Yum! Thanks for sharing. Those copycat cheeder biscuits…look great. I know!!!! My fav biscuits ever!! I LOVE anything Buffalo chicken. They don’t show my games on TV here so I have to go to the bar from 12:30-4:00 to watch them. Healthy food goes out the window. 🙁 Last week it was buffalo wings. Maybe next week Buffalo nachos or Buffalo chicken dip. What a great roundup of recipes! I love fall and football inspired recipes. I will be pinning; thanks Courtney! Ohh, great round up! Can’t wait to try some of these out!